A crisis has befallen our world. For centuries, we have depended on the Kingdom Stone... but its strength is fading. It cannot keep up with our growing demand for energy. The Prince of Shuigang, poisoned with madness over the death of his father, has spread machines across the land to steal energy from other kingdoms. Tensions are growing, and I fear that war may be inevitable. 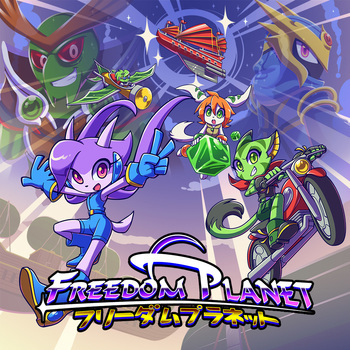 Freedom Planet is a Platform Game produced by indie developer Galaxytrail/Strife, based on characters by artist ZiyoLing, developed on the Multimedia Fusion 2 platform. The gameplay is similar to Sonic the Hedgehog in that it focuses on high-speed platforming, but it puts an equally strong focus on combat and mixes in a bunch of other vaguely recognizable gameplay elements such as Mega Man Zero-styled combat and Gunstar Heroes-styled bosses. The game is designed to feel like 2D Japanese import titles from the PlayStation/Saturn era, combining detailed sprites and environments with high-quality music tracks, full voice acting, and animated cutscenes. It was released on Steam on July 21, 2014, after a successful Steam Greenlight campaign, later seeing release on GOG Dot Com on December 2nd and the Humble Store. A Macintosh and Linux version of the game was later released on April 17, 2015, a Wii U version released in North America on October 1st, 2015, and a Playstation 4 version was released on March 21, 2017. A Nintendo Switch version was announced at E3 2018 and is slated for a release in Fall of the same year. The infamous alien warlord Lord Brevon's campaign of galactic conquest comes to an abrupt end when, one day, his dreadnought is ambushed over the primitive planet of Avalice by Commander Torque of the local Space Police, stranding both of them on the planet. Brevon hatched an elaborate scheme to drive the planet's three great kingdoms into war with each other over the Kingdom Stone, so that he would be able to claim the stone to rebuild and power up his spaceship and army of Mecha-Mooks. As Torque lost most of his equipment and his crew, he has to ask for help from the locals. Enter the true heroes of the story - an Action Girl trio of Petting Zoo People: Draconic Humanoid Sash Lilac, her best friend, Wildcat Carol Tea, and hound dog Milla Basset offer to help Torque in his quest with their unique abilities. A sequel, titled Freedom Planet 2 was announced December 2015. Taking place two years after the first game and starring the same three protagonists, the game's storyline deals with Merga, an ancient Water Dragon freed from her prison due to the events of the last game. The game sports a visual update and features customizable difficulty and the ability to revive on the spot. A demo that contains the first stage along with several unlockable features is available for PC. You can find it on their website here. 1-Up: Hidden in some stages, as disembodied head creatures that resemble your chosen character, locked in a cage. Freeing and collecting them gives you an extra life. Achievement System: The game has over fifty Achievements that can be unlocked through gameplay. Some of them involve performing feats such as finishing a boss with a specific attack, amassing a very large amount of crystals in Adventure Mode, completing the game without dying, and speedrunning the game. Action Girl: Lilac, Carol, and Neera Li. A.I. Is a Crapshoot: Averted with Syntax, who remains obedient to Lord Brevon. Alien Non-Interference Clause: Lord Brevon criticizes the Chasers for breaking their Prime Directive. Torque quickly points out that they only did so because Brevon kept endangering every world he's visited (and subsequently conquered). Milla's asymmetrically colored bracelets and anklets swap colors when she faces a different direction. The lock of hair over one of Lilac's eyes is always on the one further away from the camera in 3/4 and profile angles. From the front, however, it's over her left eye. Animated Outtakes: Holding down and the special attack button on certain cutscenes unlocks an outtake of that scene. Examples include Lilac losing her cool at Carol at the very beginning, and the Royal Magister going on a tangent about currency during Lilac's fake confession. Animesque: The game's art style has elements of a Japanese import game; however, the game's themes and motifs lean towards medieval China. Since Milla meets Lilac and Carol for the first time after the second level, her adventure starts with an entirely different first level. At one point, Lilac and Carol part ways, with Milla following Carol. Carol and Milla get their own level after this event, and after reuniting and being separated again, so does Lilac. Further story scenarios for Spade and Torque were initially planned, though Word of God is that they're unlikely to happen in the final game, but may still be made in the future as standalone products, purchased separately from the main games (except for Kickstarter backers, who would likely get them for free as part of what the KS promised). In Final Dreadnought 2, Milla will occasionally pop in and give Lilac or Carol a bubble shield to prevent them from suffocating after Brevon shuts down the oxygen supply. When playing as Milla herself, Brevon won't even shut the oxygen down. As of the later updates, there have also been bubbles as seen in underwater areas. The boss of Pangu Lagoon requires you to destroy a very large number of orbs scattered across its back, at which point its eye becomes vulnerable and you can finish it off. Due to the sheer size and speed of the boss, destroying every last orb would be a nightmare, but thankfully the game lets you off if there's just a few left. The game compensates for Milla's lack of any kind of quick or multi-hit attacks by toning down the number of hits certain bosses take. For example, Serpentine's second phase in Jade Creek starts with its windshield already partially cracked, and the "defeat 99 ninjas" challenge in Trap Hideout is cut down to 15 ninjas instead. If for any reason pushing the gem at the end of the mid-boss for Relic Maze doesn't progress the game by destroying the truck's engine, it can easily be destroyed by an attack. Awesome Personnel Carrier: the Shang Mun "truck", which is a vehicle roughly the size of West Edmonton Mall. The only thing that keeps it from being a Base on Wheels is that it's only used for troop movements. Carol lies further on the Badass end, being a cute Wildcat that knocks out robots with Rapid-Fire Fisticuffs, wall jumps, and drives a Cool Bike. Milla lies closer to the Adorable end, being an innocent wide-eyed girl, but she's still able to fight large foes despite being more fragile and lacking any martial art know-how. Lilac lies somewhere in between; she's a cute cartoon character, but not as much as Milla, and she's a badass fighter, but not a cool biker like Carol. Badass Biker: Carol's motorbike is one of her power-ups. Batman Can Breathe in Space: Averted. While the game never shows the characters in the vacuum of space, Brevon does try to impede the player by flushing the oxygen out of his ship (his soldiers don't need it, as he points out), necessitating the use of the same kind of shield that would allow you to breathe underwater to survive lest you asphyxiate to death. Bears Are Bad News: Neera Li and Spade are capable fighters, while Prince Dail uses robotic weapons to do the fighting. Beating A Dead Player: If you die while fighting Lord Brevon, he'll destroy your body with his knife and then laugh (unless you die in a way that already destroys your body). Beauty, Brains and Brawn: Milla is the beauty, Lilac is the brains, and Carol is the brawn. Given Lilac's fashion sense and fighting abilities, though, she could potentially fill all three roles on her own. Horribly averted when Lilac is tortured by Brevon, as she ends up mutilated and covered in burn marks. She does get better later. Played straight, however, with Milla, who gets transformed into a quadrupedal scorpion alien mutant thing that ends up losing an eye, exposing a bunch of green goo inside her head; when she reverts back and eventually comes to, she's perfectly fine, eyes and all. Bee Afraid: Pangu Lagoon is loaded with beehives that unleash a huge swarm of bees if you so much as disturb them. Milla saves Carol's skin after a cave-in in the Relic Maze. At the final boss of Milla's Adventure Mode, as pointed out below, Milla doesn't get to fight Brevon on foot, as she gets strangled and lifted by him. Lilac arrives in the nick of time and finished him just as she does at the end of her Adventure Mode. Big Good: The Royal Magister is this to Shang Tu. Bishōnen Line: A rather unusual take on this trope: Brevon starts fighting in his mini cruiser, then comes to fight in a mecha suit, and finally on foot during the final boss which is the most powerful phase; though you don't get to fight the last one as Milla. Bittersweet Ending: Lilac and her friends stopped Brevon from taking the Kingdom Stone, Milla is saved, and Brevon's army was destroyed. The Kingdom Stone changes forms and the Magister expresses his gratitude. But there's still several robots left on Avalice to cause trouble, Torque leaves for space, and despite their sacrifice and struggle, Brevon still escaped with his life. Additionally, the metamorphosis of the stone has released another threat. *Bleep*-dammit! : In one of the game's outtakes, Sean Chiplock drops a "god***" that was censored while having a hard time trying to be in character for one of Spade's lines. Bonus Stage: Collecting a yin yang coin will send you to a Bonus Stage after completing your current level, allowing you to use orbs collected throughout the previous stages to roll a large die and win power-ups and extra lives. Book-Ends: During the intro, the Royal Magister gives a speech about the coming conflict. He gives a similar speech during the ending about the hopeful future. Bottomless Pits: Noticeably scarce for a platformer; only two stages have them, both of which are completely justified.note The first has you on board a fleet of airships in mid-flight, and the second has you on board Brevon's ship in outer space with open airlocks. Serpentine was infected with a virus that made him completely obedient to Lord Brevon, but also drove him to insanity. In the final stages, Brevon does this to Milla, turning her into an abomination that must be fought. Break Them by Talking: Brevon tries this with Lilac. Judging by one of her conversations with Torque later, it almost worked. Open stages like Dragon Valley and Jade Creek will force you to use Lilac (who has a speed boost move) to finish it within the time limit for the stage's speedrun achievement. Carol's inability to increase her jump height (aside from the double jump of her bike) makes some of the cards literally impossible to reach. Similarly, some cards are impossible to collect with Lilac, since she often takes a different route through stages than Carol or Milla. You can stroll or flee right through most enemies just fine, whether they're crawling, hopping, hovering, or running. The only time their bodies hurt you is when they're covered with spikes or other hazards or the enemy is actively attacking by ramming, squashing, or divebombing you. Likewise, obstacles such as disappearing platforms, crushing traps, and most animations will not instantly kill you beyond the surface level threat. Also notable is that when Carol reaches max speed on her bike, she can inflict collision damage on enemies by running them over. The game overall treats collision damage realistically instead of traditionally. The Fire Shield also allows you to inflict this on enemies, and when Neera and Dail use it, they can inflict it on you. Color-Coded Armies: Shuigang soldiers dress in green, Shang Mu in red, and Shang Tu in blue. Color-Coded for Your Convenience: The three enemy ships in Sky Battalion have different wall colors: Blue for the Metal Ship, red for the Fire Ship, and green for the Earth Ship. Conservation of Ninjutsu: In full effect at Trap Hideout. Carol has to fight ninety-nine ninjasnote in a downplayed extent, Milla has to engage with fifteen, none of whom pose much of a threat. Afterwards, Spade fights you alone, and he's one of the hardest bosses in the game for Carol to defeat. Continue Your Mission, Dammit! : Stand still for a minute during a stage and your character will tell you to keep moving in some way. Wait long enough, though, and they stop complaining. Continuing Is Painful: Just for Torque, thankfully. Your ammo gets reset back to the default amount every time he dies, which can make boss fights where you might have relied heavily on a specific kind of ammo near impossible. Convection Schmonvection: Zig-zagged: while standing very close to fire won't hurt, standing on platforms heated by Syntax's attacks for too long will burn the character. The same applies for Neera's fire shield and certain fiery enemies. Cool Big Sis: Lilac acts very much like one towards Milla. Cool Bike: Carol has one that appears from nowhere when she encounters a can of gasoline. It enhances her moveset by enabling a Double Jump and the ability to drive on walls. Creative Closing Credits: The ending credits have a little fun when going through the voice actors, including The Shuigang King still being headless, Carol congratulating the player, Serpentine crawling out of his One-Winged Angel form's armor and despairing over the loss of his arms, and Syntax getting into a slap fight with another similar robot from Pangu Lagoon. For the most part, every attack and ability characters are shown using in cutscenes applies in-game as well, but played straight at the end of Lilac's battle with Brevon, where she hits him with three Dragon Boosts in a row - the third one being a SUPER Dragon Boost, which cannot be obtained without assistance from a specific power-up not present in that battle arena. And at the end of Milla's Adventure Mode, Lilac doesn't even have to beat him down conventionally to do the above. Damn You, Muscle Memory! : It's rather easy to try to use a move exclusive to one character with another and screw yourself over, especially if you've been playing with a certain character for an entire run. Longtime players of the Sega Genesis Sonic games will likely instinctively push down on the joystick to curl into a ball while on slopes, to no avail (though this does work as Carol, and pressing the attack button while doing so as Lilac executes a ground-based Cyclone). Darkest Hour: The end of Jade Creek. Brevon has both the Kingdom Stone and Torque, the other three are fugitives on the run from Shang Tu, the three kingdoms are on the brink of war, and the rest of the party splinters after a falling out between Lilac and Carol. Then Lilac rushes off to confront Brevon on her own and things go From Bad to Worse. Brevon's theme, which is already pretty grim to start with, has many variations that play during Final Dreadnought stages and the battle against him. The Game Over theme includes a dark reprise of the main Freedom Planet theme. Death Is a Slap on the Wrist: There is virtually no difference between losing a life and getting a game over. Both will just reset progress to the latest checkpoint. Exploited by Spade when fought by Lilac in Sky Battalion. He gets thrown overboard, but had a backup chopper to catch him. Also happens to the ninjas at the end of Trap Hideout, indicating they're not dead, just defeated and their motorcycles destroyed. Description Cut: Lilac is excited about the night she and the other girls are going to have, believing they'll definitely have something to do, especially with the new girl. It then immediately cuts to the girls laying around doing nothing, with Carol complaining that she's bored. In the first stage, you have to run from a rock, Indiana Jones style. If you think you can jump on a higher platform and let it pass, you'll be in for a surprise when it respawns behind you after you drop back down and continue the chase. Doing this does net you an achievement, however. Being defeated during the fight against Neera in Jade Creek will result in the player getting arrested instead of dying. There's a point early on in both Thermal Base and Relic Maze where you can use some of the stage's obstacles to clip through the ceiling. Doing so lands you in a hidden room full of goodies. Being defeated during the final phase of the final boss will result in Brevon continuously attacking the player's corpse until it explodes, if the killing blow didn't do it in the first place. Brevon really wants to be sure you're truly dead, it seems. Added in v1.20.2, to prevent players from accidentally spoiling a track from a level they've never played before with the game's collectable cards, the game requires the player to complete the game at least once to unlock them. In Fortune Night, she fights Robopanther on Torque's plane instead of running. In Final Dreadnought 3, Milla doesn't have to fight the boss. This is because the boss of this area is a Mind Raped Milla that's been turned into a giant monster; since Milla can't logically fight herself, the boss battle is skipped. Her story mode reveals that Brevon defeated Carol in an ambush and Torque needs to get her to safety, while Milla tries to catch up with Lilac. As for the next cutscene, Brevon tries to kill Milla, only to be saved by Lilac (repeating the same scenario of her Story Mode). During Final Dreadnought stage 2, Milla will not show up to give shield and health drops. Consequently, Brevon will not shut down the oxygen. Difficult, but Awesome: Milla. She has only half the maximum life of other characters and can get killed really fast, she has no moves that give her brief invincibility frames to evade attacks with, and her attacks are rather sluggish and awkward. However, she has a deflector shield that will make short work of bosses like Serpentine and Spade, and her charged attack can hit from a safe distance while still having the deflector proprieties, plus her ability to top up her damage output by picking up and throwing items. To top that, she can flutter jump for a moderate amount of time, which can let you either skip areas or dodge incoming attacks with ease, and her charged attack has recoil that can be exploited to get a lot of acceleration Rocket Jump style. She can also gain an impressive amount of momentum by using the recoil of her charged attack, though doing so consistently and well is very difficult. Finally, she gets elemental shields that can sustain one hit more than what Lilac and Carol get and has the ability to sniff out and dig up power-ups like said shields at various locations, rather like the Rush Search ability from the Mega Man games. Difficulty Levels: Four in this game. From easiest to hardest: Casual, Easy, Normal, and Hard. Difficulty Spike: Sky Battalion. The game tells you the gloves are off by pitting you against bosses who're just throwing attacks mindlessly will get you killed fast. And if that wasn't enough, Thermal Base will make you rage with more traps and bosses that are even harder, and it steadily ramps up the difficulty from there. A hidden, lighthearted message with Lilac and Carol can be found within the game's voice filesnote inside the voice folder with files li_0p_01.ogg though li_0p_06.ogg under folder "li" (Lilac) and ca_0p_01.ogg through ca_0p_03.ogg under folder "ca" (Carol) where they acknowledged the game being downloaded off the internet for free. Lilac and Carol aren't condemning those pirating the game, but they are asking them to consider donating money to the developers. Here is the message when assembled. Averted in regards to hacking into the game's inner workings to play beta Torque and Spade. As of the 1.20 version, any attempts at doing so will crash the game. The game also happens to be licensed Creative Commons Attribution-NoCommercial 3.0 . Double Jump: Lilac can gain some extra jump height with her Dragon Cyclone move, while Carol can perform a double-jump while riding her motorcycle. Milla can flail around with her paws and ears to fly upwards. Downloadable Content: Future ones were planned, and would have been free of charge as thanks for successfully achieving Kickstarter funding milestones in excess for what was asked for the development. As it stands, however, the only DLC that was released before the developers decided to move on to the second game was Milla's story mode. Torque and Spade were also scheduled to become playable with their own stories, but the developers nixed that idea (though Torque did have enough development to receive some beta gameplay) and stated that the two may get their own Gaiden Game instead of being added on to the current game since their gameplay styles wouldn't have meshed well with the majority of Freedom Planet's regular stages. Upon defeating Serpentine's aircraft in Jade Creek, the character who you aren't playing as jumps from outside the screen to deal the final hit. If you're playing as Milla (who aids as an NPC when playing as any of the other two characters), this defaults to Lilac. Easier Than Easy: Casual difficulty. In addition to taking less damage, your character's health regenerates, unless your HP is at 0, in which you'll have to get at least one Health Petal to kickstart it. In a game without Collision Damage and very few Bottomless Pits, this makes most of the game a breeze. Pressing down near a bench will make a character sit down and rest on it. In the second part of Fortune Night, there are bathrooms. Entering the men's room will promptly get the heroine kicked out and whoever is in there will utter an annoyed "hey!". Also, those shiny disco balls in Fortune Night will change your Idle Animation into a dance when you stand still near them. There's even a achievement for doing so. The stages are manageable, but the bosses can reach this difficulty, particularly in the final levels. Later bosses in all three stories typically have you dodging Bullet Hells (of which you can only survive two or three hits) as well as the bosses' minions on the ground and only getting to attack occasionally, with high chances of missing. It doesn't help that the latter bosses can dish several "petals" worth of damage in one hit, take plenty of punishment and surprise you with new abilities at low health. Accounting for the drawbacks of character mechanics can also be frustrating: Lilac's Dragon Boost can get you right in the harm's way because the boss has started another attack while you charged. Carol's motorcycle breaks right when you need it most. Milla's main attack needs charging to use, which does not help at all with mobile bosses. All in all, consider yourself a pro if you beat any of the characters' stories with fewer than 50 deaths on Normal difficulty. Egocentric Team Naming: Subverted and then averted. After our heroines join Torque on their mission to find the Kingdom Stone, Carol decides to name the party Team Lilac. Lilac herself is not amused, and the topic never comes up again. Electric Torture: When Brevon captures Lilac, he subjects her to excruciatingly painful torture via electrocution to force Torque to spill his secrets. By the time she's rescued, she's covered in burns and what little hair she has that wasn't cut off has been completely incinerated. Lord Brevon acquits himself perfectly in the game's opening sequence, one that most game antagonists would be envious of. He successfully invades Shuigang's palace by breaking through the floor ("Our walls are impenetrable!" "Your floor isn't. "), joins the battle and casually shrugs off sustained gunfire while slaughtering Shuigang's guards with just a dagger, captures Prince Dail, and decapitates his father, on-screen, in front of him before grabbing the poor kid by the neck and subjecting him to what was likely a painful brainwashing process. It also demonstrates that the game is willing to break boundaries of what would normally be acceptable for a "kid's game" for the sake of its story, which it can do thanks to being an indie title with no publisher. And when Adventure Mode starts, Lilac will immediately rush to help someone in danger while Carol will simply snark, calling her "Miss Heropants" and leave Lilac to do the hero job, before realizing things are really dangerous and going after her friend, obviously worried. Evil Sounds Deep: Subverted and played straight. Brevon has a threatening and deep voice, but so does the Magister. Expy: The (pre-DLC) playable characters correspond to the classic Sonic the Hedgehog playables: Lilac is Sonic (focus on high speed), Carol is Knuckles (slower with gliding and wall climbing), and Milla is Tails (Also slow, but with flight). Extreme Mêlée Revenge: After defeating Lord Brevon for the last time, Lilac/Carol will deliver multiple Dragon Boosts right into his gut/ravage his body with vicious claw slashes until the screen fades to white, and then black. As described above, in the opening sequence, Brevon decapitates the king of Shuigang on-screen. Interestingly, only his head explodes into feathers, leaving just a headless corpse. What violence does occur is bloodless, however, and in some circumstances when characters 'die', they explode into feathers. Played disturbingly straight when Lilac is captured and tortured by Brevon in Thermal Base. When the others rescue her, she is covered in burn scars and her hair tendrils have been cut off. If you look closely, you can see blood on them. Fantasy Counterpart Culture: Avalice (the game's planet) bears some strong resemblances to China, and some of the graphics contain Chinese characters. The five basic shields even represent the five elements in Chinese lore: Fire (shields from fire and deals contact damage), Water (enables underwater and vacuum breathing), Earth (attracts gems and protects from attacks of that type), Wood (attracts red petals that give health, causes gems to occasionally also give health, and protects from poison attacks), and Metal (protects from spikes and electricity/lasers). Fashionable Asymmetry: Milla's outfit is largely symmetrical, but she wears a green bracelet and orange anklet on her right side, while wearing an orange bracelet and green anklet on her left. The Federation: Torque works on behalf of the Coalition of Planets, where he and his former crew of Chasers have been gunning for Brevon across the galaxy. Fighter, Mage, Thief: Lilac, Milla, and Carol fit this dynamic. Lilac is the Fighter with her sense of justice, straightforward manner of fighting, and general 'toughness'note Since some of her abilities give her temporary invincibility, she's less likely to take damage than the others in the hands of a novice. Carol is the Thief with her somewhat less heroic tendencies, and other tricks she has 'up her sleeve'note metaphorically since her outfit doesn't have them, like Wall Jumping. Milla is the Mage due to her low health and the 'spells' she has for compensation. Time will tell as to what the other characters in the expansion will fit in. Fighting Your Friend: Lilac/Carol end up fighting Milla in Final Dreadnought 3 when Lord Brevon turns her into a mutant. Four-Fingered Hands: All characters have them in the in-game sprites, though official artwork consistently gives them five fingers. Furry Reminder: Milla runs on all fours (unlike Lilac and Carol, who run upright). Carol mostly averts the trope but does like pouncing on things. Game-Breaking Bug: The cutscene after Fortune Night on the Wii U version will sometimes crash the system (and that's the system, not the game—the power button will not work, and it must be hard-reset or unplugged), during Syntax's line of "Have you beheaded the intruders yet?" The cause is as of yet unknown, but it's related to the line itself—the glitch can be averted by skipping the cutscene or interrupting the line before Syntax says "intruders." Gameplay and Story Integration: Lilac is a water dragon. As such, she can stay underwater twice as long as any other character can. It comes in handy for the Lilac-exclusive level, which has a few water areas to explore, as well as for Final Dreadnought 2 after Brevon filters out the oxygen in the ship. Gameplay Roulette: Each of the playable characters have vastly different abilities, to the point where the only thing they have in common is the physics and level design. Lilac has the most traditional platformer style with an emphasis on speed, but mixes in an equal amount of combo attacks, Carol plays as a straight brawler, Milla has moves more akin to Super Monkey Ball with fast, careful movements and stiff controls, and Torque was planned to be a run and gunner ala Vectorman. The bosses look and behave like they stepped out of a Treasure game with Bullet Hell tactics. Giant Enemy Crab: The boss of the Shoot 'em Up level. Gotta Catch 'Em All: Each level (except Final Dreadnought) has 10 hidden cards. Each stage has an achievement for collecting all the cards in it. Green and Mean: Brevon and his army are characterized by the color green, perhaps not coincidentally, sharing a color motif with the above-mentioned green-themed Shuigang. Grimy Water: Toxic green sludge appears at a couple points in the Milla-exclusive Aqua Tunnel stage. It'd be helpful if the game actually explained what the various pickups even do. The "shield" crystal pickups (except for the rainbow one) do not have obvious effects (except for the water bubble one) and they all "pop" if you get hit twice, which makes them all seem like they are just simple damage shields of some sort (like in Giana Sisters: Twisted Dreams). The rare Yin-Yang Symbols also don't appear to actually do anything but grant you a bonus level upon the stage's completion. Perhaps the most baffling are the multicolored orbs that mainly can be obtained from treasure chests; they are used to get more attempts in said bonus stage, and the difference between their different elements was purely cosmetic... until Torque's gameplay was revealed, as they double as ammunition for his various elemental weapons. Even starting the game on Story Mode still doesn't tell you what any of this stuff actually does. One rarely-known and poorly-documented ability that Milla possesses is the ability to sniff out and dig up power-ups at specific locations. Hailfire Peaks: Thermal Base mixes fire and water elements into one stage. Hard Levels, Easy Bosses: Compared to Lilac, at least, Carol generally tends to have an easier time with bosses than she does. Her Wall Jump and rapid kicks which also grants Mercy Invincibility when using it allows her to completely cheese a surprising amount of bosses in the game, while Lilac's dragon boost is harder to hit with and deal large amounts of damage, and unlike hers, Carol doesn't need a full special gauge to use it, allowing her to spam her special far more often. However, she tends to have a far harder time with the levels thanks to being slower and lacking the ability to shoot herself up to places, forcing her to take longer and more dangerous routes as a result. Harmless Freezing: Losing to Neera will cause the player's character to be frozen solid before being grabbed and sent back to prison. Near the end of Jade Creek, Neera shows up again in an attempt to freeze the player, only for it to backfire, freezing her instead. Lilac: Pangu Lagoon. After being rescued from Brevon's torture and recovering, the Magister sends Lilac to Pangu Lagoon to investigate a cave containing matter similar to what was used to build Serpentine's mech. Carol: Trap Hideout. After Lilac and Carol have a falling out, Carol and Milla go to the Red Scarves' hideout to confront Spade. Milla: Aqua Tunnel. It's her stage 1, replacing Dragon Valley. It's a shortcut to the Relic Maze, where she tries to bring her ingredients for her Super Feather Potion to find her parents, then sees Lilac and chases after her. High-Speed Battle: Lilac normally does this on foot, Carol rides her motorcycle, and Milla either on foot or with someone else's support. Humongous Mecha: The boss of the third stage is Serpentine in a giant robot panther. It takes all four heroes working together at the same time to defeat him. A preview can be found here . If you ask someone to guess Lilac's species from a picture, chances are, they won't get closer than "Some kind of terrestrial mammal". Originally conceived as a hedgehog back when Freedom Planet was still a Sonic fangame, she has undergone a slight redesign, but is still unrecognizable as what she really is: a dragonblood. Lampshaded when the game acknowledges she has a mixed heritage. Likewise, Carol's sprite has been mistaken for a lizard due to ears looking like spiny fringes and bright jade coloration, none of which evokes "cat". Milla, sporting long floppy ears as well as orange and green color scheme reminiscent of carrots, has been called a rabbit by a reviewer or two, despite being a basset hound . And Spade looks more like a weasel or squirrel than his panda brother. Strangely enough, just about every non-playable character is recognizable. In Medias Res: Aqua Tunnel, Milla's first stage, is chronologically set somewhere closer to the middle of the story, when the heroes have been captured. After Milla is re-captured and thrown back into the cell, the game then flashes back to the events following Dragon Valley, and the levels progress as they would for the other two. Jungle Japes: The second half of Dragon Valley. The first half is more of a wasteland area with traces of jungle in the lower sections. Kick Them While They Are Down: If you lose to Lord Brevon's final phase, he finishes your character off by butchering them, causing them to explode into a cloud of feathers. Large and in Charge: Lord Brevon is by far the tallest and heaviest character. Lag Cancel: It's possible for Lilac to cancel out of her Dragon Cyclone with a Hair Whip (or a Dive Kick when in mid-air), which not only shortens her recovery animation but also kickstarts her energy meter's recovery. Last Ditch Move: Prince Dail tries to pull a last-ditch effort to finish off the player after his defeat at the Battle Glacier, but is interrupted by Spade's ambush. Lightning Bruiser: Of the playable characters, Lilac is the fastest and has the strongest normal attacks. Lord Brevon fights like this as well. Mama Bear: Lilac certainly fits this trope, despite not being related to either of the other girls. Compared with Sonic 3 and Knuckles, the acts are roughly the same length, with half the level, followed by a miniboss, then a second half that is a variation on the first's level themes or introduces a new twist, followed by a penultimate boss. The difference being this game lacks any superficial act breaks. Among these, Battle Glacier is the longest, featuring a brief Shoot 'em Up section, a fast but difficult trek through snow and explosives, a miniboss that's quite a Difficulty Spike, and an extensive switch puzzle that requires thorough exploration. The Final Dreadnought acts take the cake. What they lack in individual mini-bosses is more than made up for by the fact that each act of 4 is all part of one giant level with a boss in each, making it roughly 3 times the size of most levels with twice the bosses. Mayor Pain: Mayor Zao of Shang Mu. While he's far from useless or incompetent, he's greedy to the point of almost starting a war. He sort of grows out of it eventually and becomes useful during the battle to reach Brevon in Battle Glacier. Meaningless Lives: Run out of lives and... you respawn at the last checkpoint, like a normal death. Mecha-Mooks: Brevon's ground troops are all robotic. Minecart Madness: Milla gets one in the transition between the two parts of Relic Maze, but not much happens in there. Missing Secret: There are a few treasure spots Milla can dig up that are empty but will still play a voice clip of Milla being pleased when she finishes digging. In these cases, the treasure spots remain on the floor, and Milla can dig as many times as she likes and sound satisfied. Mood Whiplash: Surprisingly common. The game is mostly lighthearted, but when things get serious, they get serious. Examples include Brevon's invasion of Shuigang, the political and legal intrigue that occurs between Sky Battalion and Jade Creek, Lilac's Cold-Blooded Torture, and Milla's FaceMonster Turn. The demo version of Dragon Valley's theme has an excerpt from Final Fantasy IV's Theme of love. You can still hear it a bit in the final version. Sky Battalion's music has a segment taken straight out of Sonic & Knuckles's Flying Battery Zone. The boss theme against Prince Dail's two boss fights also have a segment from there, and another part from the first two Wily levels in Mega Man 2. The opening part of Thermal Base part 1 mirrors that of Metallic Madness from Sonic the Hedgehog CD. Musical Spoiler: Averted with the game's collectable cards. The game locks the music until the player finishes the game at least once to play the tracks. Myopic Architecture: In the game's opening, Brevon breaks into the supposedly "impenetrable" palace by burrowing through the floor instead of trying to take down the walls. Neck Lift: A couple, courtesy of Lord Brevon. Never Found the Body: Brevon, as the Royal Magister points out in the ending. If you look carefully during the ending, you can see a suspicious ship fleeing the Final Dreadnought just before it crashes, implying that he barely escaped. Nice Job Breaking It, Hero! : Apparently, the Chasers have a Prime Directive. Brevon calls Torque out on throwing it to the wind by shooting down Brevon's ship over an inhabited planet and setting the events of the game in motion. Brevon however, neglects to mention that said shooting was a direct result of his actions, and he's just as guilty, if not more so in altering the planet for his own ends. Ninja Pirate Zombie Robot: Carol. Thief and ninja who rides a motorcycle. The ninjas in the Trap Hideout also ride bikes. Nintendo Hard: The majority of the bosses can be difficult to defeat on any difficulty besides Easy, featuring fast attacks, Bullet Hell tactics that require you to understand and abuse the characters' invincibility frames, a lack of Mercy Invincibility that will shave off large chunks of your health bar within seconds if you're careless, and making full use of your combat techniques, mind you this is in a game that almost entirely lacks Collision Damage, Bottomless Pits, and one-hit-kills, yet is still challenging. The levels themselves, particularly in the latter half of the game expect you to fully learn every trick your character is capable of with new mechanics in each level. OH, and the game loves to swarm the screen with enemies that take several hits to dispatch, and the previously generous health drops become increasingly stingey. Then there's Hard mode, which not only doubles the damage you take, shields break in one hit, a few bosses have altered and semi-randomized attack patterns, and is designed to not be affected by most of the difficulty-balancing patches. Something was deemed too hard on Normal and nerfed as a result? Still the same on Hard. And somehow, it still manages to be fair in its difficulty. Noodle Incident: Whatever happened between Lilac and Spade. And the stuff Lilac and Carol did in the past as members of Red Scarves. There's also something that Spade did in the past. As Carol puts it, "There are lines we don't cross and he crossed em..."
Not so Fast, Bucko! : In Jade Creek, our heroes see Torque being captured by Brevon's forces. Naturally, they quickly go after them, but Serpentine interferes, and by the time our heroes beat him, Torque is long gone. In Thermal Base, after triumphing in a difficult boss battle with Syntax, Brevon himself shows up and captures Lilac. Before Milla's fight with Brevon begins, she's crying her eyes out in terror. With Lilac and Carol, they immediately freak out when they realize that Brevon tricked them into removing the device just to turn Milla into a monster and force them to fight her in Final Dreadnought 3. One-Winged Angel: Serpentine and Milla are changed into mutant bosses in Final Dreadnought. One-Woman Wail: Happens during the last parts of the music for Relic Maze 1 before it loops. Oxygenated Underwater Bubbles: Rather than consuming them, however, they form a pocket of air around you. Panda-ing to the Audience: The King of Shuigang, General Gong, Prince Dail, Spade, and Neera Li are anthropomorphic pandas. However, you fight the last three as bosses, and they can put up quite a fight. Peek-a-Bangs: Lilac during her dancing Idle Animation in the second part of Fortune Night. Percussive Maintenance: Lilac's answer to a glitchy robot asking for a password is to kick it. It works. Plot Hole: There are a handful of situations where the game simply does not explain how the characters get from Point A to Point B. The most glaring example in earlier versions was when the heroes are thrown in jail by the Magister for conspiracy. They hatch not one, but two plans to resolve the situation, both of which fail. Despite that, the game moved on to the next stage with no explanation as to how they escaped. Even the next cutscene gave no insight. This was eventually fixed in the 1.20.2 update: they were able to escape by Carol using her bike to crash through the wall. Power Crystal: Aside from the Kingdom Stone, technology on Avalice appears to be powered by crystals, often small and blue. In gameplay, collecting 200 will reward you with an extra life. Prehensile Hair: Lilac's main form of attack is to whip her two long strands of hair at enemies. She can also form them into a wheel to roll around or spin like a top. Primary-Color Champion: Inverted. Whereas Sonic, Tails, and Knuckles are (currently) themed after primary colors, the three playable characters in this game are themed after secondary colors, with purple for Lilac, green for Carol, and orange for Milla. Punctuated Pounding: Lilac does this to Brevon at the end of their battle. With Dragon Boosts. Lilac sees Lord Brevon contaminate Milla, and has to fight her mutated form. After unsuccessfully trying to wake her up, Lilac goes on a Roaring Rampage of Revenge and fights Lord Brevon. After returning to Avalice, Carol runs out of a tent, informing the others that Milla is alive. If the game is played as Carol, more or less the same thing occurs, but Carol is the one who fights Milla and Brevon. If the game is played as Milla, she instead runs into Torque and a badly wounded Carol and is told that Lilac went to fight Lord Brevon alone. Milla gets there ahead of her and fights Lord Brevon's first two forms, but it's Lilac who finishes him off. After returning to Avalice, Milla runs out of a tent, informing the others that Carol is alive. Recurring Riff: The two big ones are the main theme of the game, which gets revisited throughout other tracks in the game, and Brevon's theme, which gets multiple variations (either during cutscenes or during the Final Boss fight) and also appears during some of the Final Dreadnought themes. The game also takes a cue from the Sonic 3 & Knuckles soundtrack and offers two themes for each stage (4 for Final Dreadnought) that are variations on each other. Recurring Boss: The game is big on this. Serpentine, Prince Dail, Syntax, and even Brevon's battle cruiser are fought more than once, albeit with slight or major differences in each battle. Red Eyes, Take Warning: Brevon, of course, has these. Prince Dail also gets them after being brainwashed in the intro cinematic, and so do Serpentine and Milla just before they mutate. Regenerating Health: On Casual and Easy modes. The first one is quick, and, combined with reduced enemy damage, makes it hard for players to actually run out of health. The latter is much slower but can provide a welcome respite if you can rest or dodge all of the boss' abilities to regenerate. Note that the game is actually balanced around the player getting hit every once in a while: sheer density and random attack patterns of enemies in latter levels makes perfect play nigh-impossible. Replay Mode: Completing the main game will allow you to replay any level on the save file, à la Sonic the Hedgehog 3 & Knuckles. Retraux: Freedom Planet is a game boasting a presentation style akin to an import Sega Saturn or PlayStation-era title with detailed 2D sprites, voice acting, and synthetic sample-based music. The Rival: Lilac and Carol have two: Spade and Serpentine — whom they fight one additional time depending on which character you play during the story. Rolling Attack: The ground roll seen in Sonic games was once a normal move for each character, but has since been limited to Carol, and it's far less effective than in Sonic games, too. It does, however, allow Carol to perform the Wild Slash move while she's rolling. Running Gag: Mayor Zao often has text indicating +5 stat increases appear above him, such as 5% OFF or +5 SARCASM. There's a duck guard who appears in two cutscenes plus one exclusive to Carol's storyline. He remains quiet during them, only to quack at the very end. His last quacking at the credits reveals that Strife is the one who voices him. Sad Battle Music: "Neo Chase", which plays in only two boss battles (for Lilac; only one for Carol), and both are plot-significant. Sequel Hook: As the Magister points out, there's still plenty of mutants and robots roaming the land, and Brevon seems to have escaped by the skin of his teeth. Also, the secret software piracy dialogue involves Carol worrying how they'll fund "the next game." Sequence Breaking: A few of the Achievements are built around sequence breaking certain parts of the game. For example, the door in Dragon Valley that requires you to push a block onto a switch to hold it open can be skipped by ricocheting Lilac's Dragon Boost off the wall at just the right angle. Shoryuken: Lilac's Rising Slash move. She even spins like Ryu and Ken as she performs the attack. Sky Battalion BGM takes the cake when it comes to music. It opens with a strong resemblance to the Storm Owl's stage theme from Mega Man X4, then crosses into the Air Battle music from Sparkster and tosses in the unmistakable beats of the Flying Battery zone from Sonic 3 & Knuckles. All of the above, naturally, are airship stages. Note that the level also has you disable exactly THREE enemy airships. The first few seconds of the Pangu Lagoon boss theme is also reminiscent of X's intro stage. Serpentine's boss appearance in Fortune Night mimics one of Green's Seven Force forms from Gunstar Heroes. Syntax in Final Dreadnought 1 also mimics Seven Force's Crab and Urchin Force forms. Then in Jade Creek, Serpentine's helicopter is a near-exact homage to the first boss in Vectorman. By hacking into the game data, the content there reveals that Torque's battle style is akin to Vectorman's as well. Lilac's fighting style (melee attacks with charge-up directional dashes that have invincibility frames) appears to be lifted directly from the Genesis version of Sparkster. Likewise, the enemies are either Mecha-Mooks or assorted cartoon animals with highly developed Schizo Tech. Serpentine, in particular, borrows heavily from Sparkster's Lizard Folk, some of which were snakes with arms . Commander Torque's shellduck disguise kinda resembles Socket. The goofy face Lilac occasionally makes on the save file screen is a nod to Sonic emerging from the first game's title emblem. Relic Maze has Lilac try to reach the Kingdom Stone before Zao's forces do. Along the way, both her and the invading Zao forces encounter a number of large emerald-shaped gems that are more than likely decoy stones. Pangu Lagoon likewise has a section very reminiscent of the Hidden Palace Zone from Sonic 3 & Knuckles, where shield crystals take the place of Chaos Emeralds. The game's Diesel Punk Wutai setting bears more than a passing resemblance to the Benderverse; Fortune Night stage might as well be called Republic City Zone. Unlike Avatar, though, the game's world is a bit closer to actual Chinese history and culture in that it has THREE great kingdoms and FIVE elements. The "running boss battle" segments were used before in Sonic Advance 2. During the boss battle with Serpentine, he'll say, "Those who cross Brevon will die!" His upward shooting attack resembles an attack performed by Fighting Fefnir. His flamethrower pattern not-so-subtly resemble's one of Burner Man's attacks. Neera's pre-battle taunt is "You betrayed the law!" Fans of Digimon noted that the extra lives in this game (which resemble chibi-head versions of the character being played, that also happen to be trapped in cages and bounce around happily when freed) looked very similar to the Baby Digimon of the franchise ◊, strongly resembling the ones who look more like their evolved/older forms . Additionally, Milla almost resembles a more anthropomorphized version of Terriermon, right down to having the same color scheme (white and green), green markings on the ears, and being mistaken for a rabbit despite being based on particular species of dogs. The Kingdom Stone was responsible for aiding the sapience and intelligence of the lifeforms on Avalice through unknown means—just like the Monolith from 2001: A Space Odyssey. As mentioned above, Torque follows the "Prime Directive," a concept originating in Star Trek: The Original Series in which space travelers are prohibited from interfering with the culture or technological progress of civilizations less advanced than their own. Shown Their Work: The setting takes heavy inspiration from Wutai tropes and Chinese history, with the world itself having fairly accurate architecture and themes. This is most on display with Fortune Night, which features a recreation of Chinese celebrations dragon floats, statues of the city's monarch, stringy fireworks and a good attempt at traditional music. Even though the writing itself uses both Chinese and Japanese characters, they're not arranged to look foreign just for the sake of it, if you take the time to read the signs, they're for practical services like clothing stores, bike shops, bathrooms, and advertisements you'd find in any other large shopping district. Skippable Boss: In Relic Maze, you can simply ignore the level's first boss and instead just destroy the truck's engines. You get an achievement for doing this. Sidetrack Bonus: There are plenty of goodies tucked into the corners of each stage, and a bit of exploration almost always leads to something useful. Speed Echoes: Spade's dashes leave behind green after images that follow him. Spin Attack: Lilac's Dragon Cyclone move lets her whip enemies on the ground after gaining momentum or mid-air. To the entire generation of 16/32-bit platformers. While Sonic 3 & Knuckles is the most prominent source of inspiration, the game also crossbreeds Sonic's mechanics, pace and ambience with Mega Man X, Rocket Knight Adventures, and Gunstar Heroes variations on combat that do away with classic Sonic's more simplistic bosses. Back in 2006, the lead developer of Freedom Planet had worked on a fangame project named Sonic Strife that was an experiment in making a Beat 'em Up platformer out of Sonic. You can tell how that concept eventually evolved into this game. Stealth Pun: At one point, there is a wooden air ship. It is soon attacked by three other flying ships: the Fire Ship, the Earth Ship, and the Metal Ship. Wood, fire, earth, and metal are four of the classical Chinese elements. The fifth element shows up after the original wooden ship is shot down, it becomes a boat, making it a water ship! Story Difficulty Setting: Inverted — "classic mode" automatically skips all the cutscenes in the game. Supporting Leader: Torque. The protagonists spend the majority of the game helping him complete his mission to stop Lord Brevon. Would've been averted had the game receive the DLC in which he becomes playable. Surprise Creepy: Freedom Planet is relatively lighthearted for the most part, but still has Brevon, one of the most horrifically amoral villains in gaming history, who severely darkens the tone of the story. This includes onscreen decapitation, wanton murder, brainwashing, open and shrugged-off genocide, and unbelievably brutal maiming and mutilation of the protagonists. Suspicious Videogame Generosity: You get four Meaningless Lives in between a tricky deoxygenated section and a tough boss. This Is Unforgivable! : In Final Dreadnought 4, when you get to Brevon, you can tell that Lilac or Carol (depending on whoever you're playing as) is royally pissed off at him for what he did to Milla, and she lets him know of this in no uncertain terms. Tiger Versus Dragon: Carol being the "tiger" and Lilac being the dragon. However, Lilac and Carol are friends; the "versus" part doesn't apply until Jade Creek, when they have an argument and split up, and they reconcile later. Tomboy and Girly Girl: Carol and Lilac, respectively. On top of that, Milla looks to be even more "girly-girl" than Lilac. Once the training challenges are passed by any character, one can play a simple Mahjong mini-game in the Time Attack mode. It is optional. The beginning of Battle Glacier is a Unexpected Shmup Level where Lilac rides a dragon and Milla, Carol, and Torque ride Shang Mu tanks. It cannot be accessed via the time attacks though. Victory Pose: At the end of every level. It gets played with a lot — from about the 5th stage on, some gimmick or interruption dampers the victory (usually resulting in the characters making a much more subdued victory pose), and in several cases a cutscene plays out instead, followed by the results screen. Entire game: Wutai. Avalice is Planet Wutai, and most levels have elements of Chinese architecture and mixed in. Serpentine in Fortune Nights is fast and smart, throwing out attacks with wide coverage as you move in for an attack of your own, all of which are designed to punish sloppy jumps. He comes not long after several easier, slower, larger bosses in the Relic Maze, and he demonstrates just what named characters can do against you. This is followed by Neera Li in Jade Creek. It's the game's way of showing you that the bosses often have multiple parts that need to be taken out before you can land a proper hit, and that throwing attacks mindlessly will get you killed fast. And not long after that there's a rematch with Serpentine! Wall Jump: Carol can cling to walls and kick herself off of them in a style similar to Mega Man X. The purple stationary turret enemies fire one that actually looks like a wave. It can do quite a lot of damage. You also ascend a huge one in Final Dreadnought 4. While it's firing. Jade Creek: The heroes are now wanted fugitives, Torque gets kidnapped by Brevon's forces, and Lilac and Carol have a falling out and split up. Thermal Base: Lilac is captured by Brevon and tortured in front of Torque; the pair are only narrowly rescued by Carol and Milla, who are revealed to have gone for help despite Carol's earlier threat to leave Lilac for good. Pangu Lagoon: After she's healed of her injuries by the magister, Lilac goes to investigate the ruins of an old civilization. There she fights a massive dragon, only for it to be revealed that it was a projection generated by an ancient security robot, who then plays a recording detailing that dragons came to Avalice centuries ago after their starships were stranded from their homeworld. Lacking any way to return, they used their energy reserves to create the Kingdom Stone, an artifact of great power that would provide technology and power to help the planet's technology improve as Lilac's ancestors slowly died off. Final Dreadnought 3: Brevon turns Milla into a mutant and forces her to fight Lilac/Carol. The last fight with a mutant, Mega Serpentine, appeared to end in his demise; this one ends similarly, with Milla's limp body lying on the ground. Lilac/Carol are absolutely broken up about this and swear revenge. What Happened to the Mouse? : In Battle Glacier, after Spade attacks his brother, Prince Dail, both of them vanish. Neither of them are seen again after that, and Spade's DLC campaign would've revealed what had happened to them. Likewise, Torque's DLC would've shown Brevon's fate and wrapped up the Story Mode of Freedom Planet. Writers Cannot Do Math: In Milla's story, the game states 28 hours elapsed between Relic Maze and Jade Creek, but the math disagrees: she goes through Relic Maze one evening, meets Carol and Lilac, spends the night at their tree house, spends all of the next day flying to Shang Mu, spends the night on an airship, arrives at Shang Tu the next day, and winds up in prison that evening. So, it's closer to 48 hours. Wutai: Avalice is practically Planet Wutai with Chinese architecture, allusions to the Romance of the Three Kingdoms including political struggles, a worship of dragons, and assorted Japanese and other Asian influences.